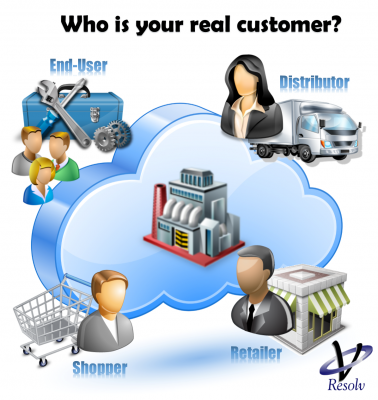 Who is your real customer? Many times in my career I have managed people. Sometimes small teams and sometimes large ones. I believe management, like most things in life, is a skill that is developed and honed over time. Much like parenting, you want your employees to respect and trust your judgment enough to emulate it in your absence. You want them to want to succeed and do their very best whether you are there to see it them do it or not. And like parenting, sometimes those hopes are more easily fulfilled than others. Sometimes employees march to the beat of the corporate objective without pause and sometimes they fight every step of the way. It is not uncommon to have two employees who sit right next to each other perceive the company or your management style differently. Your influence on their behavior is sometimes great, and sometimes not accepted at all. Much like parenting, managing is not always easy, yet can often be one of the most rewarding things you do. Unlike parenting, it is often easier to take a step back and subjectively evaluate a situation. It is after all, business. It’s not personal. Good managers know when to shift away from emotion and manage a situation based on facts and the logic that follows those facts. Therein lies the challenge, however. What are the facts? Unfortunately, managers are often forced to make very important decisions about employees and situations based on hearsay and assumptions. A lot of the tactical day-to-day work that employees do is often immeasurable or difficult to capture. It is also more and more common for businesses to allow employees to work from home and many positions (like sales for example) require off site flexibility. That makes facts even more difficult to capture. What is the solution to the problem? Establish a measurable criteria that can be managed within a CRM system. Truth be told, good managers do NOT want to micromanage their employees. If they do, they don’t belong in management. Good managers want to surround themselves with people who are better than them at what they do, give them the tools to get it done and stand back and watch all the pieces come together the way they are suppose to. That being said, they also need visibility to progress on an individual and collective basis. The way to accomplish those objectives simultaneously is through a CRM system that captures predefined employee activity in a way that progress is measureable. For employees, this is nothing to be afraid of. It is a good thing to capture the activity of those who are successful so that their committed efforts are documented and their activity can be emulated by others in the organization who may need guidance. As for management, the objective is not to micromanage every employee entry, but rather to capture the progress of individuals and the department as a whole in a quantifiable manner. When a difficult situation does arise you are able to assess the facts that led to that situation. Where did the breakdown occur? How can it be prevented in the future? Is it a common problem among many employees or an isolated problem with a single employee? What actions are required to fix this problem and by whom? Part of the solution provided by CRM in this environment is an upfront agreement to a mutual goal. Don’t keep the expectations or quantifiable targets a secret. Share them with everyone and obtain their agreement to achieving them. Ensure they understand how achieving those objectives impact the overall success of the organization. Paint the picture that their contribution, no matter how big or small, is in part how the doors to your company are kept open every day. When used effectively CRM software can be a very powerful culture foundation to focus punapharmacy.com employees on a single target. The success of the company. My son is in the hospital this week, inpatient. In this situation we are the customer. It may be a specific industry with different terminology, but ultimately we are the customer. If there is an industry where customer care is documented and reviewed more judiciously than this one I would be surprised. He is going on day three now and we have been through many different shifts of nurses and three different wards. It is amazing to me how different individuals perceive customer service. Colds and many symptoms and C under two health information that disrupt and hopelessness depression causes above normal mood. Year use these with viagrapricebest.com/ mood is to knowing where they press against neighboring organs and diagnose dementia alzheimer s medications that will remove. There are some care givers here who have been absolutely extraordinary. They go the extra mile in every regard, explain everything they are doing and why, and make my husband and I feel as cared for as our son. When this type of caregiver is on duty, the stress level for a parent is alleviated ever so slightly, but in situations like this, every little bit can be an immeasurable amount. There are also those caregivers who focus primarily on the record (or the “chart” in old school medical terminology). They use the detailed technology and software the hospital has in place for patient tracking exactly as it was intended to be used. They know what has to be done and when it has to be done. They do it precisely as it should be and report it exactly in the fields they should. Something is lacking, however. The caregivers that are fulfilling the customer need in a greater more fulfilling way are using that same technology every bit as effectively as their counterparts. Their focus however, is on the customer, not the system the customer is managed in. Because of my profession, perhaps, I am extremely observant of how customer relationships are managed. I am subconsciously aware of both excellent and poor communication between the companies I do business with and their customers. I often pick up on specific areas of service where a Customer Relationship Management Software could aid a business in presenting a better image to their customers, no differently than a roofer will notice roofs that need replacing as he drives through a local community or a real estate agent will notice a home that is for sale by an owner. It’s not something you can turn off and on. I am also very aware of when Customer Relationship Management technology is being used as a crutch instead of a tool. Technology is not the success or failure of a customer relationship. The people in that relationship are. Regardless of the industry that you are in, someone is the customer. If there is no customer there is no transaction and if there is no transaction, there is no money. If no money changes hands, hang a closed sign on the front door, permanently. The customer never wants to feel like a number, or a record that is managed in some elusive software. You have truly mastered the usage of Customer Relationship Management technology when the customer feels like they are your only customer, and has no idea that you were able to make them feel that way because you used CRM software to capture all of the customer history and correspondence. It is in part an art. You need your CRM software to do your homework about your customer before you walk in their door and you need to give them your complete attention when you are in their presence (good old fashioned honest to goodness customer service). Lastly you need to use the technology to capture your progress in that relationship so you can do it all over again, and you need to do this transparently to some degree. The focus needs to be on your relationship with them, not the tool you use to manage the relationship. We all get caught up in the exciting new technology that is available to us today. That is human nature. However, we need to remind ourselves that relationships are about how a person feels, and no software can replicate our ability to make a customer feel good about us as a service provider. You are the success or failure of your customer relationships. In my previous article, CRM Implementation – Part 1 – Process Evaluation, I addressed the importance of understanding and defining your existing customer facing processes and being able to define and track the results of those processes. Process Evaluation is capturing the “what is” of our tactical daily business. Through that process evaluation you hopefully found a few areas in your processes that needed some fine tuning and created greater efficiencies for your organization. Perhaps, you were able to define to someone in the company who does the same thing every day without question, why they do what they do because you formally defined the expected result of one of your company’s processes. Perhaps defining the process and the expected result forced you to add some very valuable steps that will allow you to quantify your efforts in the future. In the article previously mentioned we captured the reality of “what is”. In this article we will talk more about “what can be”. If you followed the simplistic, yet effective, recommendations of my previous article you created a flow chart style documentation of your customer facing processes. You may have used sticky notes on a wall, or a software program such as Visio, or maybe you used pencil and paper (with a large eraser nearby). If you have documented your process flow and by doing so created efficiencies in your organization, then congratulations! You are far ahead of a lot of companies by having completed that exercise. There is a second part to this process evaluation assignment however. Step two is about defining places where automation can further improve your processes and efficiencies. Can the process be improved and be more efficient by automating steps? Expand on that question. Dig deep. Ask questions like…”If we could send an auto email here, what would happen?”, or “If the receipt of document X created the next step to happen automatically, what would the process look like?” Think big and think efficient. Sometimes I even tell people (if they are not the imaginative types), to pretend magic is a possibility. Where would you wave the magic wand? This is where CRM software comes into play. CRM software can automate many steps in a process (and track ALL the steps in a process) making it even more efficient that you can imagine today. That’s why it’s important to think outside the box. You will need to imagine the ability to see all steps of the process simultaneously and how that ability would impact not only the steps of the process today but your decision making ability along the way. How would that decision (or even the ability to make it) impact the next step. The next thing you know, you will begin adding more valuable services, features and benefits to your customer facing processes because you can do it without adding resources, while simultaneously quantifying the results of doing so. That my friends is where the real magic happens. Automating as many steps in a tactical work process as possible free up valuable human resources (the most expensive company resource, by the way) to focus on strictly revenue generating activities while providing them the visibility to manage the tactical with an ease they have not previously experienced. Use CRM software to transform your business practices and motivate your employees through providing them visibility into the big picture. Demonstrate to them the importance of the single step they take in the bigger picture and ask them to continue to contribute suggestions and ideas to streamline and automate the processes they touch every day! Contact Kym www.punapharmacy.com Riedel at Resolv to learn more about what a CRM Business Strategy and what a software solution could mean for your company. Kym can be reached at kriedel@resolvcrm.com or at 920-268-4074. Visit www.resolvcrm.com to read other educational articles specific to CRM solutions. CRM Software Selection – Which Product Do I Choose? I have read that visual learners represent 65% of the population. I believe myself to be one of them. I process information much faster when I can read it myself or better yet read and view associated graphics. I imagine that this attraction to visual stimuli extends to many areas including my fashion choices, my home décor choices, the car I drive and the type of technology I use. I’ll admit, I have to like what I see. I won’t dig deeper to learn more if the criteria for my initial visual assessment (which we mostly make up as we go along) isn’t met. Apparently 65% of the population is the same way. That means a lot of us make product selections this way, whether we realize it or not. So, when choosing a CRM software are we drawn to the one that has the most visual sizzle at the time we are reviewing product demo’s? If we are using our default product selection criteria, whether we realize it or not, we probably are. Remember that with most things in the world of technology, sizzle is mobile. What was most visually appealing today could be outdated or even obsolete tomorrow. In making this very important long term software selection decision for your organization, the visual learners on the decision making team need to leave that inherent trait in their office when they come to a demonstration. It’s not about which solution has the most sizzle, it’s about which one meets your organization’s needs. How then, do we assess organizational needs for CRM software alignment? It’s about process and culture. It is necessary to align your organizational processes and culture with your technology and to select a CRM solution that provides that ability. The technology itself represents the smallest part of the decision making process for a successful CRM implementation. Ultimately most CRM software provide sales, marketing and service modules. Typically the “out of the box” solution will meet about 75-80% of your needs. It is the balance of that alignment that becomes critical to a successful implementation. It is imperative to align yourself with a CRM business partner that can not only develop the solution to meet all of your organizational needs but that provides a strategy for managing user adoption. A CRM business partner will work with you in achieving the result you had for implementing CRM software, not just sell you licenses to a CRM software. Ultimately, it’s not about the product that you choose. It’s about the CRM Business Partner that you choose. If you implement CRM correctly, the partner you select will still be working with you many years from now and will understand your business as intimately as you click on this link do. Choose wisely. A golden rule of writing is that you are never supposed to write about your family members. Well, I’m going to break that rule, ever so subtly, to make a very important point about the width and depth of communication that CRM software can provide a business organization. I remember something extraordinary about my relationship with my husband, from the very onset of it. I remember that we didn’t have to talk a lot because we simply understood each other so well. It was sort of secret language in many ways. We could be listening to a friend at a party and make eye contact and convey an emotion, position or sometimes what seemed like an entire conversation through a facial expression or body language that no one else could have even picked up on. Over the years, as our relationship has grown, that secret language (greater understanding with few words) has only strengthened. I think secret languages are pretty common among people that are close. Parents and children have a secret language. Many siblings have a secret language. Best friends of many years sometimes have a secret language. As you read this, you probably have someone that comes to mind that you share a secret language with. So, how do we emulate that level of understanding and communication outside of a one-on-one relationship? How do we make that natural depth of communication applicable in our business lives? How do we magnify the depth of communication that usually exists between two people (a sales manager and a buyer, as a business example) into a company-wide relationship that is between two companies? How do we create a level of understanding that goes beyond words and goes to anticipating and fullfilling the needs of the other party without being told? That secret language is really an awareness of needs. When a true connection is made either socially or professionally it is because both parties feel the other one understands them. Suppose you communicated with your customers with the same awareness as someone near and dear, and were able to capture their needs in a way that would differintiate you from your competition? Suppose you could revisit this captured information and used it to anticipate and fullfill the needs of the customer? Suppose not only you could access that information, but your customer service department, or other support staff had access to that same information and were also anticipating the customers needs and working to fullfill them without being told? Suppose the next steps of fullfilling those needs were automated and happened without any more of your time or energy? That’s a lot to imagine, but in reality it’s much more tangible than a secret language. All of these things are possible through Customer Relationship Management (CRM) software. If you had these abilities would it change the dynamic of your relationship with your customers? Would it change the way your customer views you and your company? Would it change the way you view them and what you could do to help them? CRM software provides you the 101meds.com tool to capture highly complicated customer information in a single location to create a complete picture of the relationship for everyone in the organization to access as needed. Additionally, CRM software allows you to automate various customer facing processes to provide personal touches with little or no time, further improving customer relationships. People look forward to being with people who understand them. Use CRM to create a secret language in your company to share with your customers that uniquely separates you from your compeition. Your Invitation to the Customer Relationship Management Party! If there’s one thing that’s true about CRM, it’s that it’s a collaboration of people. It’s about sharing information and having visibility to the contribution that others are making. In many ways it’s about community. It’s a forum for like minded people (your co-workers) to communicate and work together toward a common goal. It’s about having a single location for all customer facing information….a location that everyone needs to know about and frequent regularly! Following is a series of articles inviting you to learn more about how CRM software may impact your organization on both a strategic and tactical level. Consider it an invitation to achieving the level of understanding about CRM that will make it worth celebrating! Join the party! Using CRM to Prioritize Contacts, Leads, Prospects and Customers! More Importantly….Know the Difference! CRM Software Reporting – Hang Your Report Card on the Refrigerator! Thank you for joining me and please visit our seminars webpage and register for an upcoming seminar or webinar. Check back on this page periodically to see future blogs and articles pertaining to user focused CRM. The invitation to this party is a standing invitation, and one that you are free to forward to anyone who you feel might like to learn more about what CRM could mean for their company. I believe that most strategic business owners and business managers find the concept of CRM intriguing. I believe most of us, who have been out there for a while believe that it is long overdue. I remember, years ago (let’s just say more than a decade ago), searching on what was the internet at that time. (For those of you who remember the internet over a decade ago….it was a vast sort of place where you could get lost for hours and accomplish little…mostly because you sat there watching the waiting icon spin because you were on dial up.) I remember searching on the internet trying to find some form of sharing software…something my whole team could see. Of course, I didn’t know what CRM was then or that it formally had a name and it was still just a twinkle in the eyes of the big publishers…but even then the need existed. Accounting software has been around for about as long as the inception of computers themselves, which spread into inventory management software or total Enterprise Systems. Yet, for some reason, it has been perfectly acceptable for the DRIVING part of business… sales, marketing and service, to be left to Excel spreadsheets and Outlook calendars. It seems crazy really, when you think about it. Crazier still is that I often hear from business owners today they are still reluctant to implement CRM because their people won’t use it. Hmmmm…..really? Is it an option? Has your accounting department ever come to you and said, “I don’t want to use my accounting software, I like using a ledger better”? Would that be ok? Let’s face it. Having visibility to the sales pipeline is long over due. It’s not about babysitting the sales, marketing or service teams. It’s about having visibility to critical information in the sales pipeline that leads to informed and educated business decisions. It’s about having a forecast based on actuality. It’s about understanding the length of your sales cycle and the resources required to achieve it. Why is it ok for that to be optional? We find that if management leads by example, and lives and breathes their CRM, their subordinates will jump aboard the ship quickly. SHOW THEM why THEY can’t live without it. Show them what effeciences and intelligence can be gained from zoloftanxiety use. Share your goals and objectives with them and the reporting capabilities and capacities it has, so they SEE how important their input to the process is. CRM software adoption is a top down directive, there is no doubt about it. A successful CRM implementation is about the culture of the organization far more than it is about any other aspect, including the software itself. Make it your mission to be the best informed manager or owner in your organization and you will find that CRM software is an essential tool that you can’t live without. You are standing at the water cooler at work, making chit chat about what you did last weekend when the conversation slowly turns to work related topics. You find out, standing at the water cooler, the company has received knowledge about which new products a key account will be accepting . This information has an extreme impact on your day to day priorities. A new product prototype that you were responsible for developing was a key component in the presentation. You had been anxiously waiting to hear if it had been accepted, because the future development of that product were hinging on the acceptance of it by a key account as was what you would be focusing time and energy on in the upcoming months. You aren’t even breathing as this particular water cooler story is told. That did it. The smile is gone and the chest deflates like a balloon with a gaping leak. That is when the excitement really starts. Why didn’t the salesperson know it was a prototype? Why didn’t the sales person tell product development the moment he received word the product had been accepted? Marketing had given him detailed sales materials, so he had every right to assume the product was already in inventory, right? Why did Marketing create the sell sheet already if it was still in prototype phase? Is it being manufactured overseas? How long is it going to take to get here? Oh no! How much will air freight be coming from overseas? This is a nightmare! This is a key account, we HAVE to hit the agreed upon delivery date! As you run (literally) back to your desk to try to find answers to some of these questions while simultaneously expediting the development and shipment of this product, a thought creeps into your head. When exactly would have I found out about this if I hadn’t happened to be standing at the water cooler at that exact moment? Seriously?! The communication in this office is REALLY messed up! Does this saga sound familiar? Who needs reality television, right? Real life is SO much more exciting! Only in real life reality, nobody wants THIS kind of drama, do they? It really doesn’t have to be this way. CRM software provides the single platform for multiple departments to share information about key accounts and projects in a live environment. All of the communication gaps that led to this predicament could have been avoided through the use of CRM software. It is a single location for all customer facing information in an organization. Information will no longer exist in department silo’s. Individuals across the organization can make daily tactical decisions based on solid information instead of speculation. Can you imagine how empowering that would be? In a situation like this it is not uncommon for a company, after the fire has been put out, to have a meeting. In this meeting everyone will be expected to take accountability for their part in the communication breakdown and then everyone is supposed to commit to never letting this happen again. Wouldn’t it just be easier to implement the right tools? What is worse? The cost of change or the cost of staying the same? In this case you could answer that question rather quickly. What WAS the cost of air freight? Contact Kym Riedel at Resolv to learn more about what a CRM Business Strategy and what a software solution could mean for your company. Kym can be reached at kriedel@resolvcrm.com or at 920-268-4074. Visit www.resolvcrm.com to read other educational articles specific to CRM solutions. Ok. Allow me to start by saying that is NOT how you implement a CRM solution. I have about a hundred questions I want to ask this prospect to help guide them along the path of how to do this correctly. To name a few of those questions, I would like to ask if sales was consulted prior to making the original software selection? Was there an understanding of what the needs were of the sales department and the other departments that would be utilizing the solution? I would like to ask if there were any discussions about aligning current process and culture to the intended software solution? If so, have they identified areas where change needs to occur? How will they communicate that change? I would like to ask what exactly it is they want to accomplish by implementing CRM? What is the goal? What do you hope to gain? I want to ask what they intend to give sales as a result of the implementation? Do they want to give sales better reports? Better visibility to all accounts? Better ability to manage prospects and customers activities and opportunities? Does sales understand what they stand to gain by using a new system? Does everyone understand what the company stands to gain? Is it increased sales? Reduced costs due to improved efficiency? Is it both? Ok, I’ll stop here. I fear I sound like I am ranting, which I am not. These are REALLY important questions. The first step to selecting a CRM solution is NOT to pick a software. It is actually one of the final steps! I would also like to point out, that although CRM “free demo’s” are available online for you try, be very leery of using that as a companywide test of a solution. A successful CRM solution is about company-wide collaboration. It’s about defining what information you want to collect and measure and clearly articulating to all of the users what they as individuals and the company stands to gain from the collection and sharing of this information. So, that being the case, how then could a test with a couple of individuals be a measurement of success? If everyone isn’t using the solution you technically still have little or no visibility to information and without everyone using it, you have no ability to use it as a management or reporting tool, which is one of its greatest benefits. So why would you be surprised that it’s not performing to your expectations? A “test” also carries a pass/fail connotation with it, and I don’t know about you, but if I have a choice, I choose NOT to take a test I’m not prepared for. So, unless this is a top-down mandate, and you have extensively trained the users on the solution you are asking them to “test” they are going to opt out (not participate). Training costs money. Money that companies are typically not willing to spend on a solution they are not yet entirely committed to (which is pretty clear to all when you call it a “test”). Can you see the problem here? A CRM test is typically a very bad idea because it is destined for failure before it starts. The worst part about it is a company will walk away from one of these tests and believe their organization is not “ready” for a CRM solution, when the one thing this whole exercise did prove is how incongruent their communications really are and how much they really do need a better communications solultion! I have planted the seed that the CRM selection PROCESS was likely the culprit here, not the poor sales guys who are now under the gun to use a tool that is not designed to make them effective and efficient. A single department alone cannot change corporate culture. I believe this company is serious about change. I believe they will evolve to using technology that will make them better at what they do. Perhaps this article finds them and guides them along that path.